This extraordinary home is located in the thriving metropolis of Istanbul and is part of a collection of villa-style apartments named The Judas Tree Houses. Designed by Baba Mimarlik Mühendislik architects, the expansive duplex is filled with palatial glamour, from its series of modern chandeliers to a range of opulent, marble finishes. The 5 bedroom apartment rests upon 370m2 of living space, and no expense has been spared in creating a majestic atmosphere within, combining elements of classic and contemporary design. Upon entrance we are enveloped in an open and spacious living area, which encompasses a luxurious space for relaxation upon a silk-upholstered lounge suite and a beautifully decorated area for formal dining. The living quarters are trimmed by large windows, leading onto a 70m2 outdoor terrace, providing the perfect vantage from which to admire the city beyond and enjoy the warm, Turkish climate. The upper level of the apartment houses the bedrooms and bathrooms. The master bedroom rests resplendent with soft textile and the flowing finishes of polished wood, while the home's primary bathroom intrigues with the depth created by its dark, marble walls, and includes all the necessities for luxurious, modern living. This home truly presents an exciting, opulent design in the midst of a bustling city, and has to be seen to be believed! Take a tour below and tell us what you think. Upon entry we're immediately embraced by a sense of opulent luxury, as marble, stone and crystal beautifully blend with wood and plaster finishes to create the striking decor. 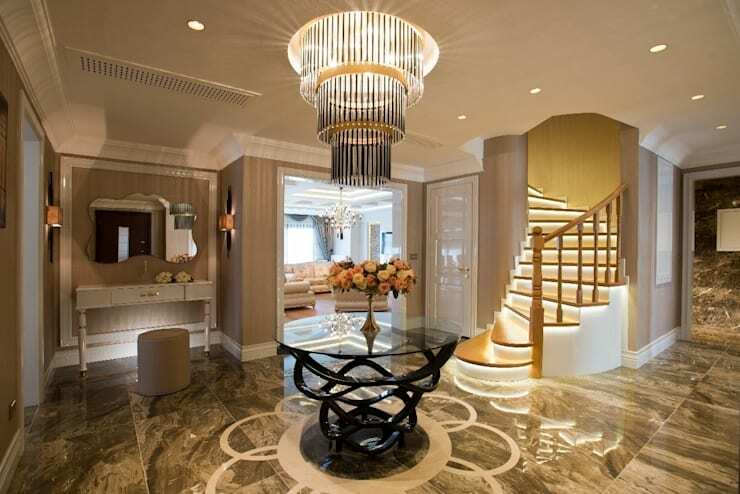 The home emits a sense of classic glamour elevated by a modern design, with features such as underfoot lighting on the stairwell and the contemporary curves of the glass-topped table contrasting against more classic elements like the chandeliers and art deco dresser and mirror in the lobby. Moving through to the living area and the home's enchanting opulence continues, with the room exuding a palatial elegance. A central chandelier illuminates the silk upholstery of the lounge suites, while the ceiling indentations and classic curtains infuse the space with a sense of decorative grandeur. A formal dining room rests adjacent to the living area, with the entire space appearing open and beautifully lit through an array of large windows. 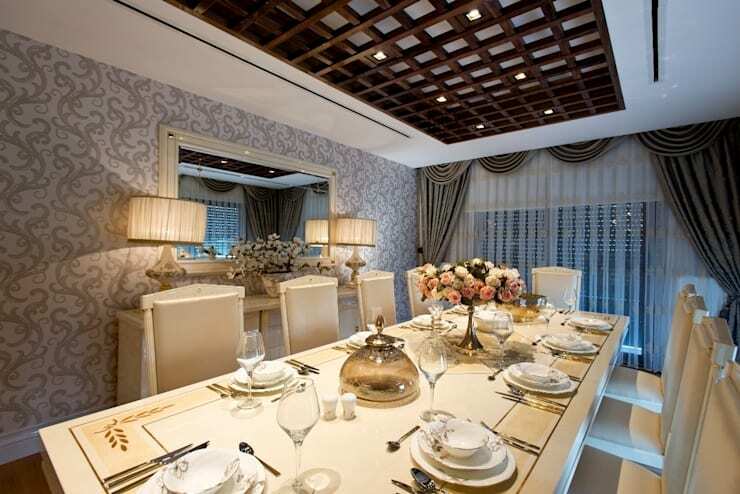 Upon closer inspection the dining room presents a heavenly scene, with the space subtly evoking a floral theme. This is evident in the patterned wall paper decorating the left hand wall right through to the details on the table cloth and ceramic crockery. The deep tone of the timber latticework overhead adds an element of contrast within the room, presenting a more contemporary design feature amidst the prevailing classic décor, while the windows streaming about provide a glorious view of the city. The master bedroom rests resplendent in its combination of classic and contemporary design. The soft curves and fabric finish of a luxurious bed draw focus within the space, surrounded by walls of sleek, polished timber. The smooth surface and flowing lines of the timber present an inventive approach to modern luxury, with the geometric array of backlit panels protruding behind the bed adding an interesting decorative element. Along the right hand wall a row of built-in robes have been included, presenting a stylish area for storage in keeping with the novel design of this bedroom space. 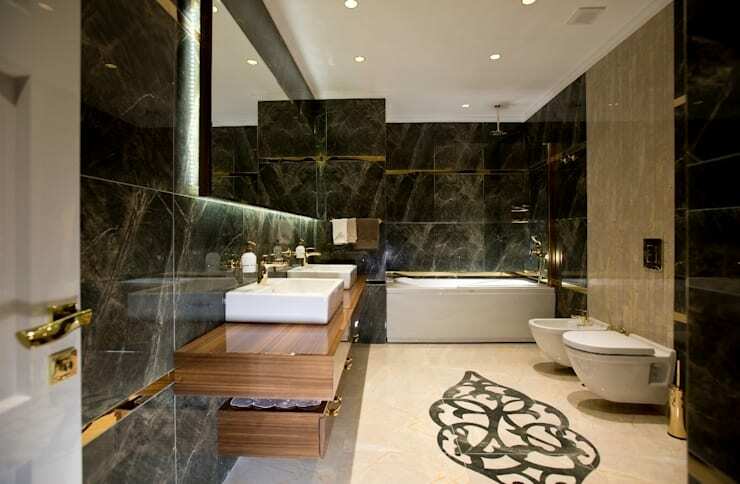 The home's primary bathroom also emits an air of luxurious glamour, with the dark hue of its marble tiles immediately creating a sense of depth within the space. The use of white and wood provide a lively contrast of colour and material, while the marble inlay on the floor presents a grand decorative feature. This bathroom includes everything necessary for luxurious living, with a bath, shower, twin sink units and even a bidet adding to the majestic atmosphere of this amazing home. Impressed by this fine example of opulent apartment living? Have a look at The Asian-Inspired Immaculate Apartment for further inspiration! Would you like to live in this amazing apartment? Tell us your thoughts below!